Are Fede Alvarez And Sam Raimi Merging Their Evil Dead Storylines? Are Fede Alvarez And Sam Raimi Merging Their Future Evil Dead Storylines? Well, well, well, Evil Dead fans – March has been full of surprises, hasn’t it? First we were treated to a slew of positive reviews which mirrored a lot of the fantastic promotional work created for Alvarez’s film, then we learned Fede Alvarez’s “remake” was more along the lines of an original reboot which was being planned as a trilogy. Mentioned next was that Sam Raimi is now planning on making a direct sequel to Army Of Darkness, but the newest news surrounding future Evil Dead movies is a doozy. You might want to sit down for this. Yes Bruce, I agree seven would be quite a nice number, but that doesn’t mean there aren’t a few questions that need to be answered beforehand. That dilapidated car seen weathered and corroded is not only a nod to Raimi’s staple cameo, a 1973 Oldsmobile Delta 88 (his first car), or not simply just a clever bit of nostalgia for fans of the original Evil Dead who would remember Ash driving that same car, but now can we assume Alvarez is suggesting the events which took place with Campbell’s character are contained within Alvarez’s world as well? As long as that’s to be believed, we’re one step closer to a crossover. My other question about a possible crossover considers which tone Alvarez and Raimi would agree on, as each film really defines its own atmosphere. Raimi’s Evil Dead was straight horror, which may have seemed a little campy due to budgetary restrictions, but it was still only horror. 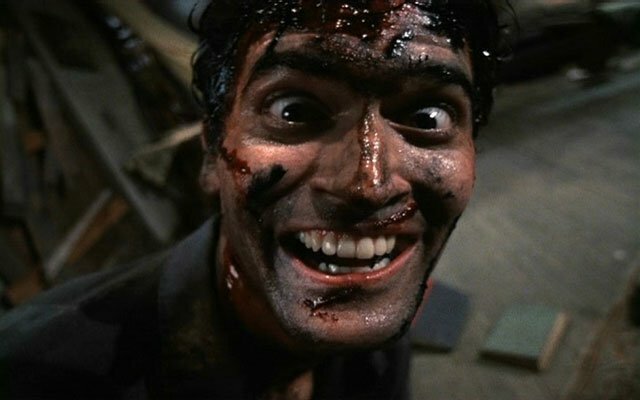 Evil Dead II and Army Of Darkness were Raimi’s more comedic efforts, which made Campbell and his character Ash into the legendary horror icon he is today. As for Alvarez, everything I’m hearing about his Evil Dead involves being dark, disturbing, and deeply scary – basically everything Raimi would have liked to do with his Evil Dead, except Alvarez was given the budget to do so. With that said though, could the two find a happy medium between styles? Or more importantly, how will the two writer/directors craft their next separate sequels with a possible joint-production in mind? Will we see Alvarez try to pepper in some comedy? Will Raimi abandon some of his schlock for straight-up terror? Unfortunately I only have questions right now, with the answers to be revealed when these two get around to their sequels. Hell, this could all be for nothing though if Fede Alvarez’s Evil Dead bombs, but with so much anticipation brewing in the horror community and with the mainstream appeal the film is surprisingly getting, I think we’ll be seeing a lot more Deadites in the future – possibly by means no fan could have predicted even in their wildest dreams.